Huia is a family owned vineyard producing organic and biodanamic wines. Here’s the production notes from the winery: “After hand harvesting, pressing and settling, the juice goes to tank for fermentation. Two thirds of the juice awaits natural fermentation before being moved to neutral French oak barrels for the fermentation and maturation with lees stirring. The remainder is inoculated with wine yeast and fermented through to wine in tank.” This Pinot Gris (same grape as pinot grigio) is subtle and beautiful, reminds me of the lovely Alsatian wines. “A mixture of honeysuckle, pear, apple and quince aromas abound on the nose, followed by white peach and some spice on the well-balanced and smooth, dry palate.” is what the winery gives as tasting notes, I can’t disagree! This wine will go great with Thai or other lighter asian fare, the bit of creaminess up front with its crisp cutting finish will pair well with creamy seafood pasta dishes, or a grilled whitefish marinated in white wine olive oil and a touch of honey, throw some fresh basil or rosemary on top! I know, I know, we just had a Zin month before last, but this one is different than that one, I know you’re going to enjoy seeing a different expression of the grape. Have I mentioned that we looooove Zinfandel? It’s America’s grape. Similar to Malbec in Argentina, it started elsewhere (probably Croatia) but now it’s ours! My folks were great Zinfandel evangelists and believed if properly made, Zins could age as well as Cabernet or a fine Bourdeaux. (I’ve had many a great bottle over 20 even 30 years old from their collection) Back to the subject at hand. This wine is named for Marietta’s Cellar Master Román Cisneros who has worked at the winery for over thirty years. Román said, before the wine was named, that it is his new favorite house wine, so the wine was named for him. Much of the work at the winery is done by hand, with an eye toward sustainability. Marietta has a small team and is focused heavily on their employees. Scot Bilbro is the second generation owner and winemaker at Marietta after his father, Chris Bilbro founded Marietta Cellars in 1979. Chris cut his wine business teeth by working at Bandiera founded by his grandparents Emil and Luduina Bandiera in 1937. The Román is full bodied, but goes lean and clean through the mid-palate, with a long lingering finish. Dale says it drinks more like an old-world wine and I agree. I love drinking Zin with this elegance! This would be great with spicy grilled Italian sausage, maybe with sautéed mushrooms and carmelized onion served on top of wasabi mashed potatoes? 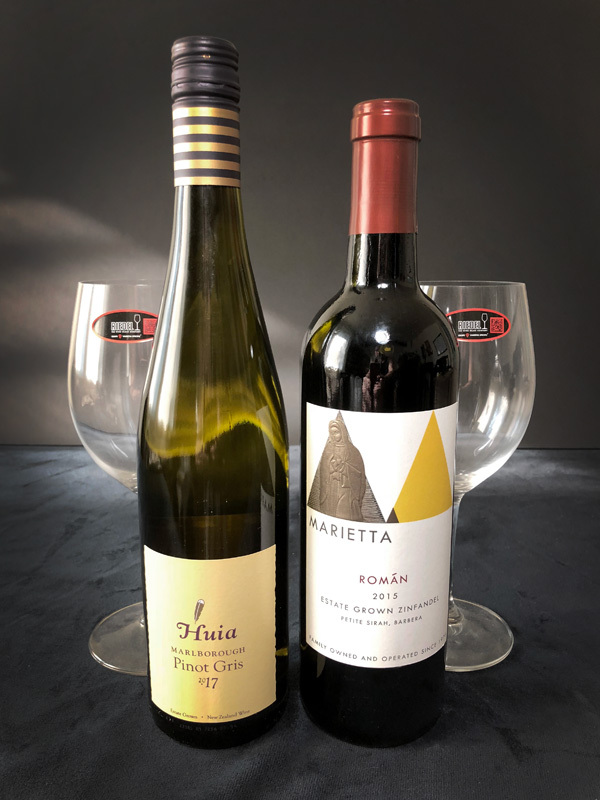 WINE CLUB members get a 15% Case discount when you pick up your club wines, since you are picking up 2 you only need to pick 10 more wines to make a case!